Back in 2004 I was working as a line cook at a restaurant and the Executive Chef was creating a new filling for our house made lasagna called "Eggplant Caviar". I remember saying to him that it sounded horrible. Two of my least favorite foods and why would he think that caviar and lasagna should be paired together in a dish, let alone with eggplant. He looked at me like I was an idiot and said that the "caviar" referred to the small seeds in the eggplant, not "fish roe" and that it was just a fancy term used in restaurant lingo. He also couldn't believe that I didn't like eggplant and said that he would convert me, no problem. Well he succeeded because I really like eggplant and I especially love using "eggplant caviar" as a filling for my lasagna, ravioli or cannelloni. Slice the tops off garlic, drizzle with olive oil, salt and pepper and wrap in aluminum foil. Slice eggplant in half (lengthwise) and rub with olive oil and sprinkle cut portion with salt and pepper. Place eggplant and garlic pouch on a sheet tray and roast eggplant for about 30 minutes until caramelized on the bottom and soft. Remove eggplant, but leave garlic in the oven for another 30 minutes until soft. Let eggplant cool to touch and then remove skin and seeds. Chop eggplant finely and place in a fine mesh strainer and press to remove excess moisture, place in a bowl and set aside. While eggplant and garlic are cooking, heat a large saute pan on medium high and coat the bottom lightly with olive oil. Add mushrooms, adjusting heat to medium, and cook for about five minutes until moisture has evaporated and they are golden brown. Add diced onion, garlic and fresh thyme and cook until onions are soft. Deglaze the pan with Madeira, white wine or vegetable stock and cook until liquid is absorbed. Season with salt and pepper. Add mushroom mixture to a food processor and pulse until mixture is minced, but still has texture. Remove garlic pouch from the oven and squeeze out caramelized cloves. Mince the cloves and then add them to the eggplant puree. Remember to reserve one head of garlic for the Tofu Ricotta. Next add mushroom mixture to eggplant-garlic puree, along with nutritional yeast and lemon zest. Mix well, season with salt and pepper and set aside. In a sauce pan heat olive oil and cook onions and garlic until soft. Bring to a boil and reduce to a simmer and cook for about one hour until thick. Season with salt and pepper to taste during cooking. Add sauce to a food processor or blender and blend until smooth. Strain through a fine mesh strainer and set a aside. Add all ingredients except for minced basil and lemon zest to a food processor and pulse until smooth. Place in a bowl and stir in basil, zest and salt and pepper to taste. Set aside. Heat a large saute pan on medium, add olive oil and garlic and cook for about two minutes. Add spinach leaves and cook until just wilted. Season with salt and pepper and place spinach in a strainer to remove excess moisture. Set aside. Cook lasagna noodles according to package. 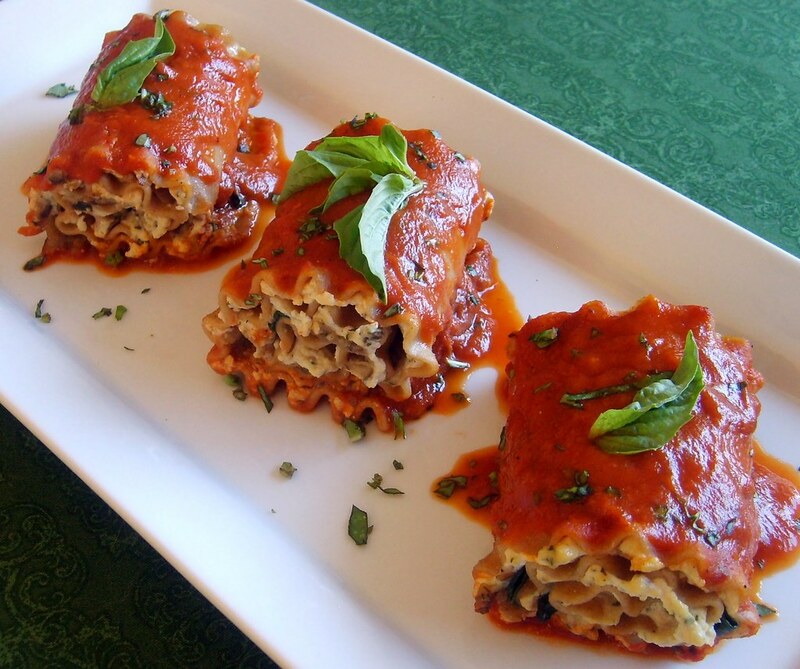 This recipe makes 8-10 individual roulades and I used whole grain noodles instead of regular. Drain noodles and brush lightly with olive and place on a sheet tray in a single layer to avoid sticking until ready to roll. Layer each noodle with Basil Tofu Ricotta, Eggplant Caviar and Sauteed Spinach and roll up tightly and place seam down in a casserole dish lightly covered with tomato coulis. Spoon tomato coulis on top of roulades, cover dish with foil and bake in the oven for 30 minutes until sauce is bubbling. Garnish with minced basil and serve with a tossed salad and crusty garlic bread. would like to try the lasagna recipe, but the link doesn't bring it up.